sure, most of the club soccer world is [supposed] to be on international break this weekend, but that doesn’t mean there isn’t a boatload going on in the world of football this weekend. 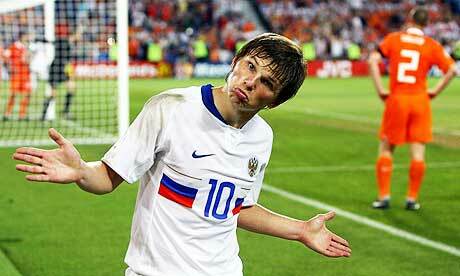 arshavin wonders, "why wouldn't you pick the russians?" MLS’s conference finals are this weekend (i’m watching the LA-houston game as i write this). the NCAA D3 soccer championships started this week, with my alumnus ohio northern university crashing out in the first round to brockport on penalties, but congrats to stevens (NJ) for their first round win. and of course, world cup qualifying will wrap up this coming week. the last of the african qualifiers are this weekend, with some traditional powers hoping for miracles in their quests to take part in the first big party on their continent. nigeria need to win against kenya, coupled with a tunisia loss or tie, to qualify for next year’s finals. egypt, reigning african cup of nations champion, have to obliterate group leaders algeria by at least a four goal margin to win their group. oceania region champions new zealand will begin playing of their two leg play off with asia’s fifth-place bahrain. bahrain are looking to make their first finals appearance, and seem to have some momentum after knocking out perennial finalists saudi arabia. new zealand, the lone “power” in oceania after australia left the region to join asia (tangent warning — still one of the most brilliant football decisions ever by a national governing body. australia is far too good of a national side to only have a half chance of making it to the finals. their winning the asian region qualifying this time around is proof of that move’s brilliance. ), are hoping to make their first appearance since spain in 1982, their only finals appearance ever. the other inter-region playoff is this weekend as well, with south america’s fifth placed uruguay taking on CONCACAF fourth placed costa rica. i’ll be pulling for the our region’s representative in this tie, as a win for them only makes our region (and the USMNT) look stronger. but on the minds of most football fans will be the beginning of the four european play-off ties, and i thought it would be proper to cast my predictions before the first legs take place. novel approach, huh? i’ll be honest here: i have no clue who to pick in this tie. off the top of my head, here’s everything i know about greece: they pulled off the cinderella of the last 50 years by winning euro 2004 but only three players from that final remain in the squad, they have a defender that plays for liverpool (sotiris kyrgiakos), and my knowledge ends there. for ukraine, i’m not much better. i know they’re captained by schevchenko, who hasn’t played like he did during his milan glory days since… his milan glory days. they also didn’t select the most beautiful horrid man-mane in football out of the squad for the playoffs, meaning we will be spared the presence of liverpool’s andriy voronin. again, after that, i don’t know anything else about them. ukraine haven’t lost since a 2-1 defeat to england at wembly, since going 3-0-2 in qualifying. greece on the other hand have looked less impressive, although they haven’t lost since a 2-0 loss to switzerland in september. however, their two wins since have been against minnows latvia and luxembourg, and they also tied moldova. so who am i picking? i’m going with form here, and i’ll back ukraine to come out of this tie. arshavin and co. are the heavy favorites in this tie, and rightfully so. under manager guus hiddink, the russians have developed into a quality side full of attacking poise. however, there is some concern about hotspur roman pavlyuchenko. the big lad up front hasn’t seen much of the pitch this season for spurs, and hiddink has voiced his concern over the former prolific scorer’s potential lack of form. as for slovenia, i don’t know a damn thing about them. i know less about them than i do either ukraine or greece. they came out of a relatively weak group that should have been won easily by the czech republic, but somehow came through after finishing by slovakia. they can’t be that awful then, right? so this makes my pick easy here: russia to roll through this tie. i love arshavin, and i expect him to lead his team through. plus, having slovakia and slovenia in a world cup finals would be far, far, far too confusing for my brain to handle. now we’re getting into the really juicy of the ties. portugal are, on paper at least, the heavy favorites for this playoff. but their qualifying campaign has been anything but stellar. sure, they only lost one match in qualifying (to group winners, denmark). but for a team that’s considered one of the most talented in the world, they should have bulldozed their group. and who can forget the absence of ronaldo, who is still out after (foolishly) taking part in their last qualifier. yes, they called him in for both of the qualifiers, but there is no way real madrid will allow him to take part in these games. none. and he shouldn’t. but his absence definitely affects their team psychologically, as losing your most talented player is never a great thing for team morale. however, i sometimes think they play better without him, as they don’t tend to be as one dimensional as they are with him on the field. normally, their offense revolves around getting ronaldo the ball, then standing still and hoping he creates some magic. bosnia-herzegovina are another team that i know little about, but for some reason i’m liking them. they came out of a tough group, finishing ahead of established sides such as belgium and turkey. wolfsburg forward edin džeko is their star man, one of the hottest properties in europe during the summer transfer window, so keep an eye on him during their home leg in particular. my pick: bosnia with the upset. i can see them pulling an away goal in portugal (probably a 1-1 draw knowing portugal), and then holding out for a nils draw at home. i know, i know. fifa will rig this game to make sure ronaldo is in south africa, but let a man dream for just a minute. french boss raymond domenech thinking, "how can i screw up the ireland ties?" and here’s the big ticket match up. two quasi-european heavyweights battling it out for a single spot in next summer’s finals. and i say “quasi” because neither team is near where they used to be. honestly, france have enough talent in their ranks that this match up shouldn’t even be an issue. let’s just look at their attacking options: henry, anelka, benzema, gourcuff, and toulalan (but probably not due to injury). they are a deep team, with a talented array of players in every position. yet the team have no confidence in manager raymond domenech, and haven’t for some time now. they’re a very dysfunctional squad, and their results show it. the irish national side is a shade of it’s former self, and haven’t really been a quality national side for quite some time now. coach giovanni trappatoni has done well to re-unite the squad though, and they’ve shown promise under the italian’s reign. but even they have some skeletons in their closet. who would you say is the best irish player is? take a look at their roster, and you would probably say robbie keane. but you would be wrong. the best irish player out there, hands down, is manchester city’s stephen ireland. don’t worry, your eyes didn’t deceive you: he wasn’t on that squad list. stephen had a falling out with the irish FA last year and has since refused to play for the national team. and that’s a shame, because he is a breathtaking footballer. keane would have had 2-3 more goals in qualifying if he had ireland pulling the strings for him. so who’s my pick in this big match up? i want to pick the irish; i really do! but all i can see them managing at home is a 0-0 draw, and then having an henry-inspired french team pull it out at home in the second leg. i would love to call another upset here, but i just don’t know if the irish can overcome france’s depth and take advantage of the french team’s shortcomings. so there you have it, my picks for the last european world cup spots. now, let’s see how they hold up. feel free to skewer me on any and all misses. otherwise, expect me to gloat extensively. enjoy all of the games this weekend!